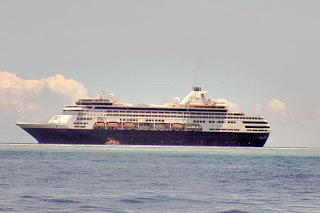 Honiara (The IslandSun) : A detailed study has revealed that average passengers on cruise boats visiting the country spend less time ashore. “The average time passengers spent ashore is lower than the global average. Qualitative research found this is partly due to: heat, lack of basic facilities and a lack of food that is perceived to be safe to consume,” it states. It says time spent on tours also influences the time spent ashore. “A prominent pattern observed by researchers was that after a few hours of a full-day stop spent ashore, many passengers return to the cruise ship for lunch and are unlikely to return, choosing to stay aboard the ship during the remainder of the day. It says in Honiara, passengers spend AUD 28 on average per day. From 1811 respondents, 55 percent of the passengers to Honiara were very ‘very’ or ‘extremely’ satisfied with the variety of things to see and do. It also states that from the same number of respondents, 19 per cent of the passengers were ‘not very’ or ‘not at all’ satisfied with the variety of things to see and do. The study found that passengers are often not expecting many services in Honiara and don’t particularly want them. “Passengers are mostly interested in, and surprised by the beautiful unspoilt locations, the friendliness of the locals and rich local cultural history. This study followed a data driven approach, including primary data collection from cruise operators, passengers, crew, and tourism related businesses in PNG and Solomon Islands. The study was released last July.